17.2.1 WHQL drivers are not WHQL! 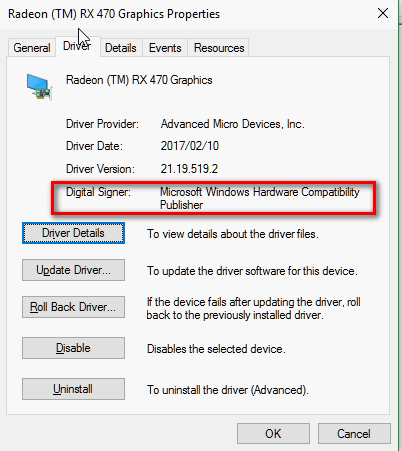 The latest WHQL drivers (17.2.1) is prompting me to "Allow trusted drivers from AMD", I noticed that some dlls is typed wrong on the driver folder, is that a bug? The newest build (feb 28) solved all the issues, thanks all! AMD released this driver today and maybe previous Non WHQL version of this driver was not correctly replaced by new files. Try to redownload it lately. I just installed this driver But I did not get any prompting. But the file .DL_ and .SY_ is the same as your describing in the AMD driver folder. Shouldn't it be the one Microsoft installs automatically? I don't know as I don't use Win10.? Just an update here, there are some users on reddit that installed this new WHQL driver released yesterday and they confirm that this driver is not WHQL. Some files is not signed and prompt us to allow amd software. I think amd just made an mistake and uploaded a wrong build. This is not the same situation. AMD marked this 17.2.1 feb22 driver as a WHQL driver from file name. And I can not find any other older WHQL driver in driver download page while it usually has two drivers on list for users. One is for latest hotfix or optional beta driver, one is for older version but WHQL. So for now 17.2.1 should be the latest driver, and at the same time, it should be a WHQL driver too. But it seems not a WHQL driver. It is almost day 2 now when I post this, but the file I downloaded again minutes ago is still the same. A new 17.2.1 is out. I have not test it yet, will install it later. GPU-Z still says it is Beta...well, anyway it should be a WHQL driver. Re: crimson relive 17.2.1 - Error message about digital signature.